Career options for graduates include ESL teachers, tutors, translators, administrators, or guidance counselors. 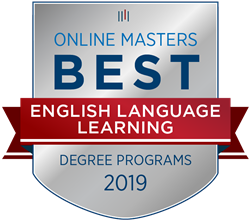 OnlineMasters.com, a trusted source for unbiased college rankings and higher education planning, announced the release of their Best Online Master's in English Language Learning Programs for 2019. The research identifies the top programs in the nation based on curriculum quality, program flexibility, affordability, and graduate outcomes.